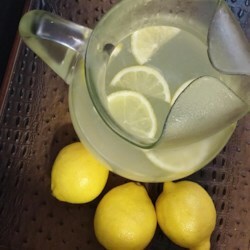 I live in Venezuela, where lemons are virtually nonexistent, so I decided to adapt this recipe to make "limeade", with very pleasant results. I used 10 limes to make 1 1/2 cups of juice, added the juice to the syrup mix after it had cooled just slightly, immediately transferred the mixture to a one-gallon pitcher, and topped it off with cold water. The whole procedure took less than ten minutes, and made a very nice alternative to the usual lemonade.